Residents at Paddock Stile Manor recently got to experience the sounds of the Highlands from the comfort of their own front room. 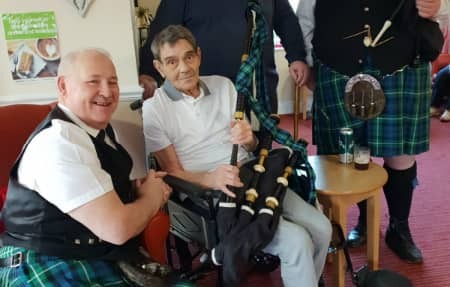 The bagpipers were invited into the home by one of the resident’s families to perform some traditional Scottish music for all of the staff and residents. The sound of bagpipes could be heard from every corner of the room and everybody absolutely loved it! “Some were amazed at how powerful and loud the bagpipes were”, commented Sophie Hall, Care Assistant at Paddock Stile Manor. The bagpipers visit proved to be so successful that they have arranged to come back for Burns Night and everybody can’t wait!